As cuts in services for struggling Americans go into effect, nine Wall Street executives who are profiting off the recession just received $1 billion in bonuses. Where is the Occupy movement now that the depravity of the super rich is on full display? But whenever a politician dares to hold those “fat cats” accountable, as Barack Obama once did, he or she is branded by apologists for the super-rich as a socialist engaging in class warfare. The outrage of the entitled as opposed to the despair of the dispossessed is the cultural norm, as evidenced by Stephen Schwarzman, one of the more egregious of those private equity billionaires. 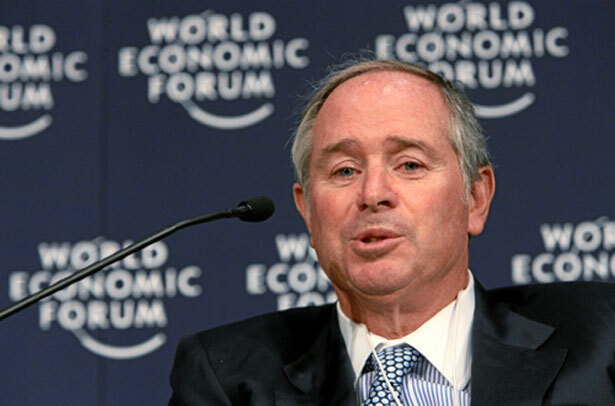 What is truly outrageous about Schwarzman is not the $213.3 million he got last year from Blackstone, the private equity company where he has long been the CEO. Heck, he “earned” that much the previous year and has been raking it in since he co-founded the company back in 1985. What is startling, and it goes to the hubris of America’s most wealthy at the heart of the current sequester impasse, is that he thinks the more than $1 billion he and eight other private equity executives got in compensation last year should continue to be taxed at the “carried interest” rate of 15 percent, rather than the 35 percent reserved for ordinary income. When President Obama first threatened to end that weird tax break for the top strata of the super rich back in 2010, it sent Schwarzman into a tizzy, complaining “It’s a war.… It’s like when Hitler invaded Poland in 1939.” At the time, Schwarzman had accumulated a fortune of $4.7 billion—now a cool $2 billion more, according to Forbes—hardly the fate of those occupied by Hitler. Last year Blackstone spent about $1.5 billion purchasing 10,000 foreclosed homes. “This is the kind of thing that happens once, every once in a while, where you see something that’s a market-turning trend and we are loading the boat,” Schwarzman said in an earnings call October 18. Those foreclosed homes are typical of the “alternative assets” in which Blackstone has specialized. But the other fat cats in the corporate world are doing quite well in comparison to the fate of regular Americans. Although corporate earnings have jumped at an annual rate of 20.1 percent since 2008, The New York Times reported, the disposable income of America’s wage earners increased yearly by a scant 1.4 percent after allowing for inflation. Corporations’ profits as a share of national income are now at their highest point in more than sixty years, while the income of their employees is at a forty-five-year low. While the country now debates the causes and cures for the enormous public debt runup since the onset of the Great Recession, it is quite clear that a national bipartisan policy of bailing out Wall Street has succeeded splendidly, but at the expense of the average citizen. Last week’s Academy Award for Argo was just another chance to u-rah-rah the CIA’s destructive exploits abroad, Robert Scheer writes.